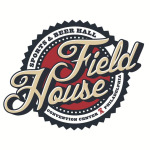 Play Bocce on Wednesdays on indoor courts at Field House in Center City. Games start at 6:30pm and run every 45 minutes throughout the night. Then stick around the bar to (hopefully) celebrate your win, enjoy the bocce specials, and keep the party rolling and make some new friends in Philly! Players enjoy $4 pints of Dogfish Head. Depending on availability, you'll have the option to choose from the 60 Minute, Namaste, Pumpkin Ale, or the Indian Brown. Soak up the beer with the special discounted food menu during League nights. Each night, make sure to check in with a Black Shirt upon arrival. Please be on time and ready to play each week. A minimum of 2 players are required to avoid a forfeit during regular season games (a min. of 3 players are required for playoffs). When you are done with your game, report your score to a Black Shirt, and of course enjoy bocce specials at the bar and make some awesome friends. Standings and pictures will be updated on the website a few days after games. Check out this Bocce league 'Center City Wednesdays' with Major League Bocce Philly !